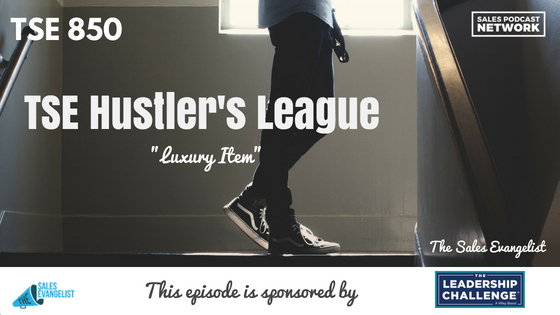 TSE 850: TSE Hustler's League-"Luxury Item"
If your prospect views your product or service as a luxury item, your sales process may not matter. If he sees it as unnecessary, or as a step that will create extra work, he’ll likely delay making a decision on it. Today on The Sales Evangelist Hustler’s League, we discuss how sales professionals can address these objections. We’ll address how you can help them address the extra work and how you can change their perspective of your product or service. Imagine you’re a house painter, and your prospect needs his house painted. Before you can paint, though, his walls need to be washed. He has so many obligations that he figures the paint can wait because he doesn’t have time to wash walls. You have two choices. Either offer a service that takes care of this step for him, or train him to do it for himself. If you find that a majority of your prospects are in this same situation, consider viewing it as an additional business opportunity. Maybe you act as a consultant or you upsell your prospect an additional service as a leadup to your primary product or service. If your prospect views your product or service as a luxury, help him understand why it’s a necessary step. Help him recognize why delaying this decision will cost him money. Or help him recognize why making the decision now will make him money. Emphasize why acting now is a better idea for his business. Even if it isn’t a necessity, explain why now is the best time. Identify all the objections your prospects might bring up, and prepare responses to each of them. If they don’t want to change providers now because it will create additional work, have a response for that. If they have a mediocre system that works for now, help them understand the benefits of acting now rather than later. Educate the prospect by helping him understand why his objections are unfounded or short-sighted. 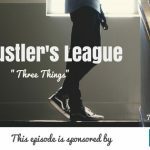 The Sales Evangelist Hustler’s League is an online group training program that focuses on group training and collaboration. It’s a hands-on opportunity for members to help each other with individual struggles. No matter how long you’ve been selling, others have faced the same challenges you do, and they may have insights you don’t have. Visit thesalesevangelist.com/hustler to get more information and to apply for the program. If you prefer, call us at (561) 570-5077. I continue suggesting the book, Stop Selling & Start Leading: How to Make Extraordinary Sales Happen from our sponsors at Wiley. It’s a fantastic blueprint of all the things buyers say they expect from sellers and want from sellers. I’m offering a free excerpt of the book so you can check it out and see the value for yourself. Grab a copy of The Science of Selling: Proven Strategies To Make Your Pitch, Influence Decisions, and Close the Deal.